I am the event co-ordinator for the first World Jersey Cheese Awards, a cheese competition purely for cheese made using Jersey Milk. The competition is due to be held in the island of Jersey on May 23rd. I am looking to contact cheesemakers using only Jersey Milk, would any of your readers be able to help? We do have a website for the awards on www.jerseycheese.com. Cheese made from the milk of Jersey cows is especially tasty, owing to an unusually high cream content. Of course, you wouldn't want to make a Parmigiano-Reggiano from Jersey milk, but most cheeses really benefit from the extra fat. In fact some cheesemakers, like the folks behind Vermont Shepherd and Nettle Meadow Kunik, add Jersey cream to their sheep and goat cheeses to give them some heft and richness. 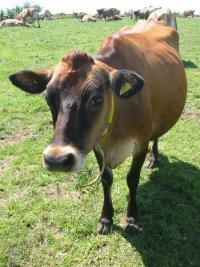 The Jersey cow originated in Jersey islands of England, but can now be found all over the world. This is the first I've seen of a cheese contest specific to one dairy breed, and it'll be interesting to see the results. If you have any leads on Jersey cheesemakers for Deborah, leave a comment here or contact her directly.